Indeed! Run the regression against just a 2-asset model of S&P and Lehman Agg. You'll find a huge beta to bonds -- about 3x that of AQR's risk parity fund. Sad! 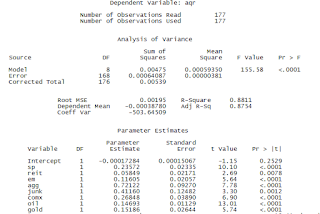 You can do regression analysis like this with a number of programs from Excel to more sophisticated tools like Python and Matlab. You take a series of daily returns to the fund, the series of daily returns to different asset classes, dump them into the regression engine and it will tell you how much the fund's performance is driven by those asset classes. Putting just two asset classes into the regression, the S&P and a broad bond index, quickly revealed that the fund was highly exposed to bonds. That's not where you want to be if rates keep rising. And that's exactly what's happened in the 5 1/2 months since. As rates have risen, the fund has underperformed even more, and is now down 14% for the year and is more than 7% worse than AQR's fund. 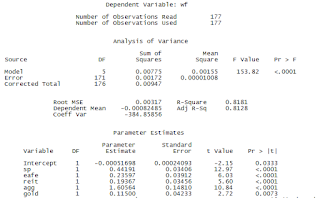 With more days of trading data, we can now run a more complete regression analysis to see what the heck is in Wealthfront's fund. As a baseline, let's look at AQR's fund first. 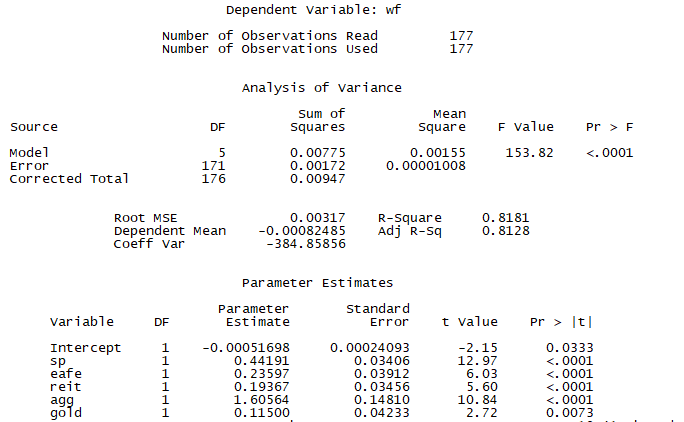 Here's the regression output using a lot of common asset classes (I tried a few others, but these were the best fit). 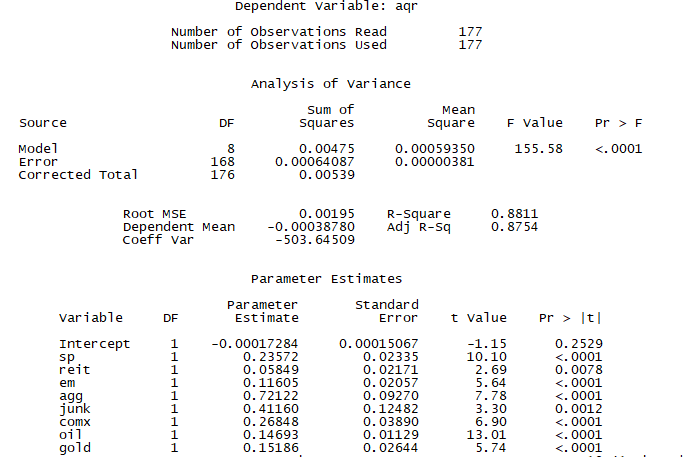 Now that is a beautiful regression. The high R-Square means that with 8 generic asset classes, we have explained 88% of the returns of AQRIX. The high t-values and low p-values ("Pr > |t|") mean that each of these asset classes is highly certain to be a driver of AQR's returns. The parameter estimate ("beta") means how much AQRIX is expected to trade up with a 1% move in each asset class. So the biggest betas are to bonds ("agg"), high-yield ("junk"), commodities ("comx" is the return to Pimco's commodity fund with the returns to oil and gold backed out), and the S&P 500 ("sp"). If you add all the betas, you get 2.11, meaning for every dollar you put in the fund, you're effectively getting $2.11 worth of exposure to the asset classes. Now let's look at Wealthfront. Just 5 asset classes explain 82% of the return, with bonds ("agg") having the greatest beta by far. Note that Wealthfront's pure bond interest-rate bet is greater than AQR's bond, high-yield, and REIT exposures combined. The portfolio managers are a couple of Ph.D.s who I suspect suffer from Menzie Chinn Syndrome -- i.e. too much math, too little common sense. If your backtest period is during the past 37 years of historically declining bond yields, you shouldn't count on that trend continuing forever. I think its important that this fund was designed to sit in a WealthFront account, where with their most aggressive risk score, the allocation to Risk Parity (WFRPX) is 13% of assets, alongside a 35% allocation to US stocks, 29% allocation to foreign developed markets, a 20% allocation to EM, and a 3% allocation to municipal bonds. In that context it makes sense that RP is especially designed to generate a high beta to the asset classes not included in the rest of WF's typical portfolio. Think of it as a risk parity "completion fund" - levering up the expected returns of the low-vol assets to be combined with a larger pool of non-leveraged high-vol equity ETFs.